tl;dr summary: many (most?) 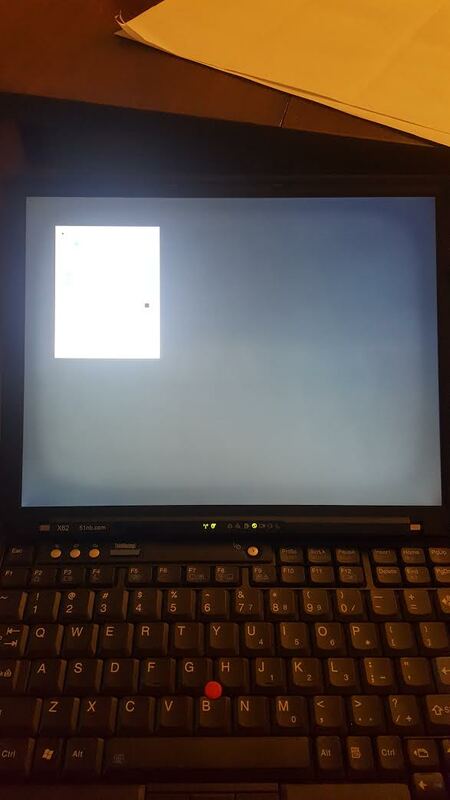 of the 12" HV121P01 SXGA screens with a 'bathtub ring' or 'retro-tv' effect around the edges are not defective, VR1 simply got knocked out of adjustment. This is one of those occasions where I feel like a complete idiot and simultaneously wonder how nobody else noticed this before. I experimented a while back with chemically stripping the front glass off HV121P01-101 screens, since these were plentiful (at the time) but you had to remove the glass and bonding adhesive to use them in an X61/X62. Mechanical stripping is labor intensive to put it mildly, and using xylene or alcohol seemed like a useful shortcut. It worked, but it also damaged the polarizer films in exactly the way illustrated in the picture. At the same time, people were getting reclaimed screens from China showing the exact same effect. I got one or two of these myself, and the polarizer films were in fact damaged just like I saw on the screens I stripped. And I assumed from there on out that chemical/heat stripping was the only explanation of the effect. Which turns out to be terribly wrong. Most LCD screens have a variable resistor adjustment as part of a temperature/drive compensation circuit. I played with it on many screens in the past, and it was a way to alter either the absolute drive or overdrive speed of the entire screen, usually affecting gamma and contrast in some fashion. That's not what it does on an HV121P01. I was modding some of the screens I'd recently bought for LED backlight, screens which I'd tested carefully on receipt and found no defects. After modding, three turned up 'bathtub ring' defects when tested. The defect appeared spontaneously, and others had noted this happen after doing an LED mod. At the time, this was deeply disappointing, perplexing and expensive. I was not going to sell any defective screens no matter how subtle the defect. Did the LED mod cause the fault? It had been near 100% humidity in NH all that week, did that do it? Was it a fault that was always there and only showed up with LEDs? Or was it always there and I had simply missed it? 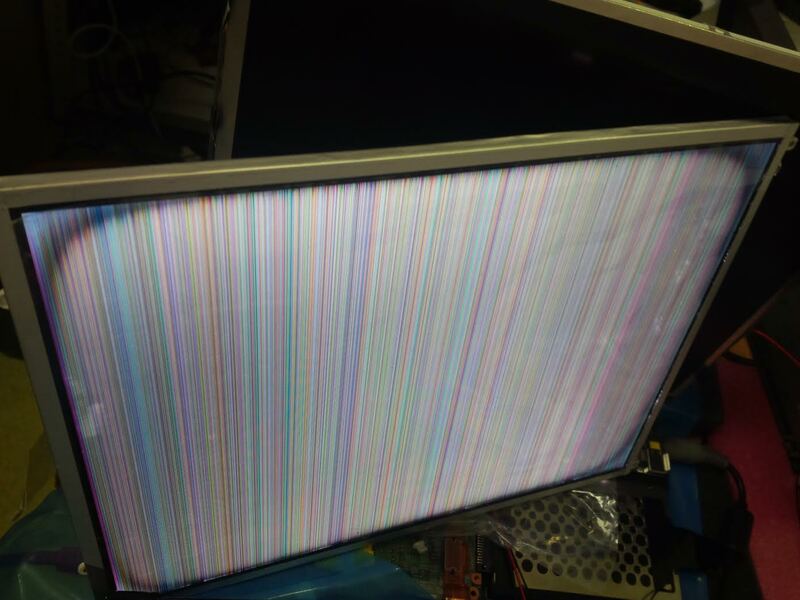 I peeled and inspected the polarizers on one screen; this panel had a replacement polarizer that was glossy, so it wasn't going to be saleable anyway. And if chemical stripping had caused the defect, missed till now, why did the *replacement* films show the problem? They didn't, in fact--- after removal and testing, they were faultless, perfectly regular in every way. I queued up a second panel for testing (I didn't want to burn my own replacement films on a potentially bad panel). Everything about it looked perfect until I was displaying low-brightness gray-to-gray stipple patterns, and that's when the bathtub pattern appeared. Could it be some sort of mismatched signal drive? I looked at VR1, which I'd never touched because I was sure I knew what it did. So I tweaked it. And the problem got worse. I tweaked it the other direction and the problem disappeared. I'm still testing in detail to make sure this isn't multiple unnoticeable problems stacking up into a noticeable one, but it sure looks to me right now that this is an adjustment to balance panel drive in the center versus the edges of the screen. It's normally fixed after adjustment at the factory with a little lacquer, but it's not the slightest bit surprising it might get knocked loose or dissolved during rebuilding or modding. VR1 probably can't mitigate a genuinely frotzed polarizer but it's obviously worth trying it just to see if it was never the polarizer at all.